When it comes to kitchen operations, temperatures are a key ingredient. Refrigerators should be set at 40 degrees or below and freezers at 0 degrees or below. 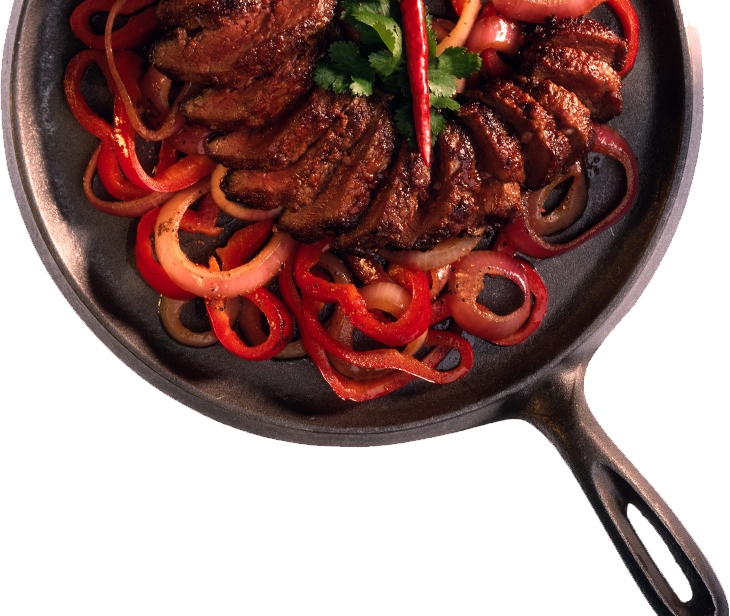 Hot food should be served at 140 degrees or warmer and cold food served at 40 degrees or colder. But what about the temperature of the kitchen itself? We know that temperature in the workplace is as important for productivity as food temperatures are important for food safety. “Studies show that as little as a two degree difference can affect productivity,” says Keven Hass, national sales manager, Gaylord Industries. Hot, humid environments can make people irritable and sluggish, and could even lead to heat sickness. Commercial dishwashers are just one of many pieces of equipment in the kitchen that can affect the comfort level of the work environment. The speed and efficiency in cleaning dishes comes from high temperatures and lots of water, that turns into steam. Luckily there are ways to control the heat and humidity produced by dishwashers and keep your kitchen comfortable and productive. In order to understand how to best control the environment surrounding a commercial dishwasher, it’s important to first understand the heat output. Sensible Heat. Sometimes referred to as radiant heat, this is the warmth produced by the equipment that radiates out into the environment and can raise the temperature, like the radiant heat of the sun warms the temperature of the Earth. Sensible heat is the warmth you feel when standing in front of the dishwasher. Latent Heat. This is the energy released when water changes to steam, without a change in the actual temperature. Humidity itself isn’t latent heat, but it contains latent heat. When an environment is humid, it can feel hotter than the thermostat says, because a thermostat only measures sensible heat. 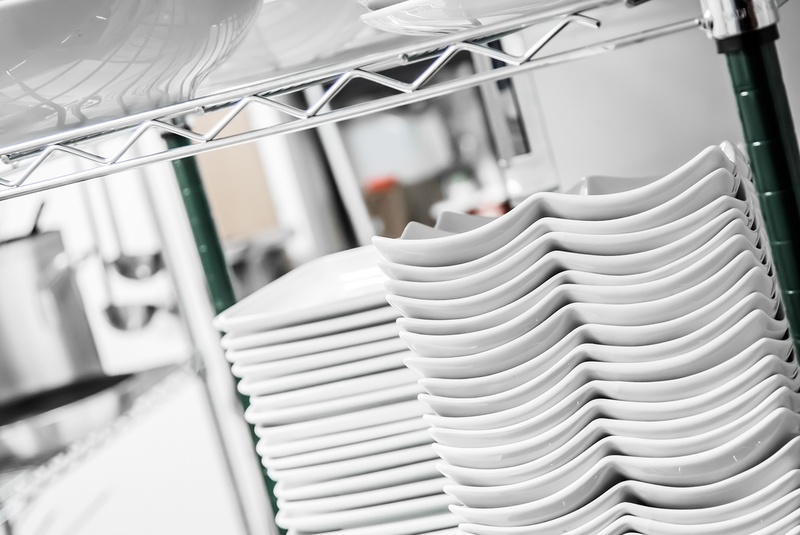 There are many elements to consider when working to create a pleasant atmosphere around your commercial dishwasher. With a full understanding of the different steps you can take, you can enjoy the efficiency and high productivity of commercial dishwashers without any adverse impact on your work environment. Kitchen Design. The design of the kitchen is important when creating a comfortable workplace. A dish room with ample space for employees to move around, high ceilings and proper ventilation helps keep the air flowing and temperatures at a comfortable level. A properly sized HVAC unit plays an important role in environmental control. A unit that is too small might not be able to cool the area to the temperature set on the thermostat, while a unit that is too big will cool the room temperature down so quickly that the unit doesn’t have time to also remove the latent heat, leaving the atmosphere uncomfortable. Work with your construction engineer to properly size the HVAC system for your particular load, which takes into consideration the size of the room as well as the equipment within the working space. Incoming Air. In addition to controlling the temperature of the room, it is important to heat and/or cool the air that is being pumped into the dish room. “The mechanical engineer should take this into account when designing a kitchen, because code states the difference between make-up air and the air in the room should not exceed 10 degrees,” Keven says. This means the air should be heated on entry during the winter months in most places, when the outside air is much cooler than the air inside. But it also means operators should consider cooling make-up air during the summer months, especially in hot and humid locations. Proper Hood Installation. 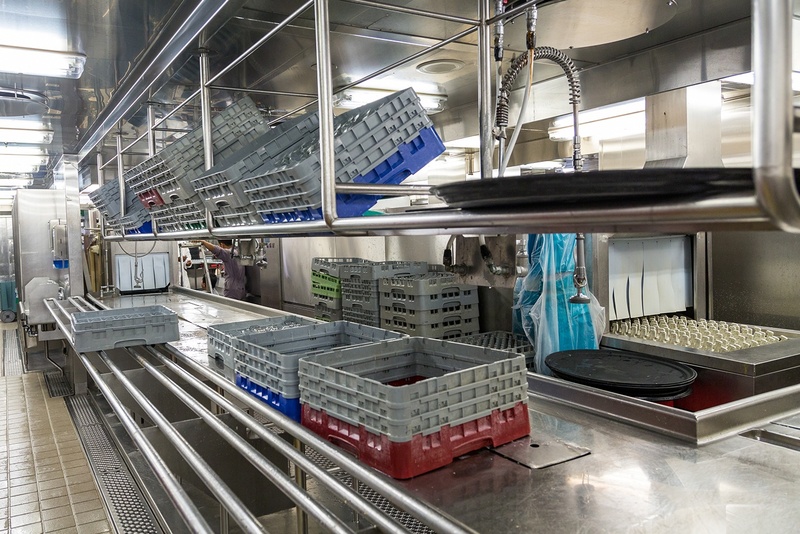 Certain types of dishwashers, including conveyor and flight-type, require a Type II hood to help remove steam from the dish room. When specifying a hood for your commercial dishwasher, take into account the amount of overhang that will be necessary to completely cover the discharge space where the racks come out or where the door is “For conveyor dishwashwers I recommend a larger overhang on the discharge side to account for the exhaust where the racks come out,” Keven says. Ventless Dishwashers. Some dishwashers do not need a hood to keep the dish room at comfortable working temperatures. Hobart’s Advansys™ line of dishwashers incorporate an energy recovery system with condensing cycle that captures the steam from the wash cycle and condenses it to heat incoming cold water. Not only is less energy needed to heat the water to appropriate temperatures for the next cycle, but less latent heat is released into the dishroom environment. In one case study in Troy, Ohio, a kitchen ran 125 cycles in a ventless dishwasher between 5 and 10 p.m. During that time the average relative humidity in a central area of the kitchen was about 44 percent, while the relative humidity over the machine was about 56 percent, well under the industry standard of 65 percent relative humidity. Call your local Hobart representative to learn more about how a commercial dishwasher can improve operations in your kitchen, and how to integrate it into your workflow while maintaining a comfortable dishroom environment for your staff. Purchasing a new commercial dishwasher is a big decision for any operation, but in K-12 schools where budgets are tight the stakes are even higher. A major capital expenditure is one that may only be considered when every other avenue has been explored. “In my experience I’ve found schools take good care of their machines. Keeping up with things like regular maintenance and adding water softeners to keep lime build up at bay are some of the things people will do to keep repair costs down and prolong the life of the machine,” said Todd Burlis, partner, Burlis-Lawson Group, Inc. But the reality is, no matter how well you take care of your machine, eventually it will be time to purchase a new one. How will you know when it’s time to consider upgrading your commercial dishwasher? For K-12 schools there are a few basic considerations. From start to finish, every step in the process of dishwashing is critical to maintain food safety and efficient operation. Proper dishroom operation is a combination of an effective machine and effective practices. Here are some “critical control points” from the experts to make your dishroom run more efficiently. It goes without saying that cleanliness and food safety are integral parts of every foodservice operation. From the moment a customer steps in the door, every team member should be focused on serving a great product safely. 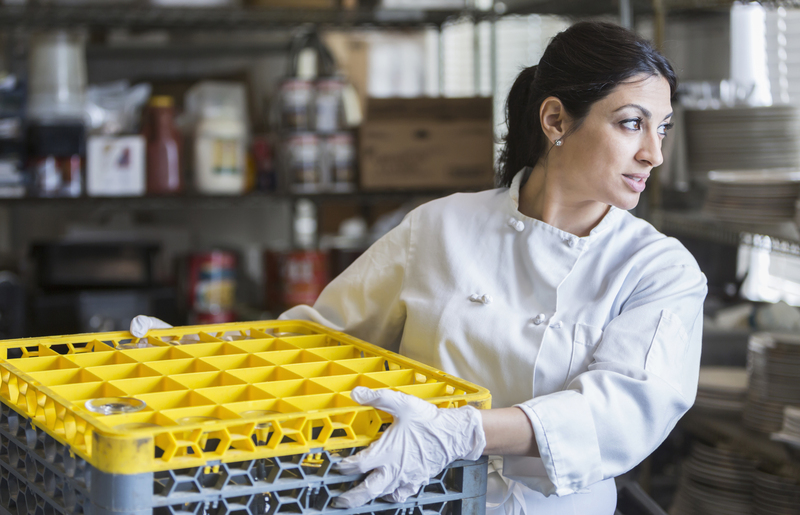 All of the back-of-house areas, from the food prep area to the dishroom, play an especially important role in protecting customers from risk; and a few simple best practices go a long way to maintaining safety.